This is one of the coolest buildings I've seen in a long time: a structure designed to turn everyone into Spider-man by allowing people to climb all over its interior and exterior. It kind of feels like a glitch in the Matrix: a computer-generated mountain that needs more polygons and some textures. Within the "boulder-like walls," which were inspired by the geological process of the large-scale movements of the earth's crust and its tectonic forces [...] The exterior is clad in white fiber cement panels, which simultaneously allows the building to blend into its snowy context while offering climbers outdoor routes. 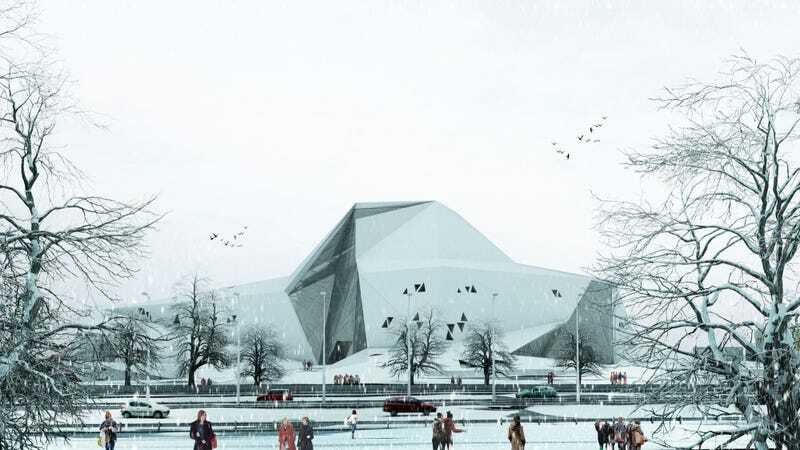 Designed by New Wave Architecture, the futuristic 48,437-square-foot (4,500-square-meter) structure is a rock gym inside and out. It will be built in Polur, Iran, an area that—apparently—is becoming very popular among rock climbers worldwide.